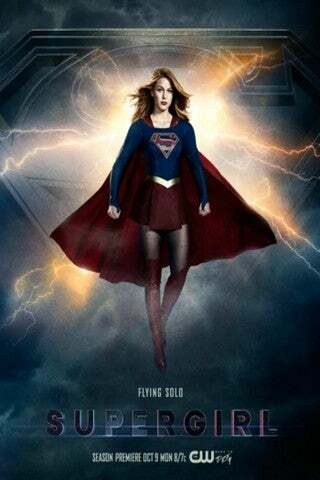 Supergirl has charmed audiences and brought to life new parts of the DC Comics mythos for three years now. But according to series star Melissa Benoist, there's one thing she likes best about the job. In a recent interview on Jimmy Kimmel Live, Benoist was asked what she considers to be the best thing about playing the Girl of Steel. "I mean, I get to fly!" Benoist suggested. When Kimmel asked exactly what effort goes into bringing those flying scenes to life onscreen, Benoist hinted that there are occasionally some challenges. "Yeah I mean, it’s hard work." Benoist added. "I’m essentially attached to a fork in the air." According to the actress, part of that hard work actually involved going to specific training classes, which helped her come up with various parts of her sort of "superhero physicality." "There’s sort of this almost superhero physicality school that you kind of have to go to." Benoist revealed. "At least, we did on the DC shows. Where a stunt team will teach you how to walk like a superhero. Or, I had to come up with an idea of how my heat vision looked and what freeze breath looked like. And really, it just looks like a staring contest, and I’m blowing out my birthday candles." And as Benoist revealed, those classes were actually pretty useful - and have had a very positive impact on her posture. "They’re awesome, and they’ve really helped me." Benoist explained. "My posture’s gotten better because of this job. I kind of [had bad posture] before, but the suit gives me no other option. It’s just a corset and when it zips up, I’m [standing up straight]." This week's midseason premiere saw Kara in a pretty unique circumstance, as she was trapped in a sort of "mind palace" after being put into a coma by Reign (Odette Annable). After displaying her aforementioned heat vision - and a lot of help from Brainiac 5 (Jesse Rath) - Kara was able to come back to reality, just in time for a unique faceoff in next week's "Fort Rozz".